The fame of Modica is mainly linked to the production of chocolate. Here the various master chocolatiers keep a particular tradition alive, handed down over the centuries, from the Aztecs to today. And it is precisely the pleasure of chocolate that brings us here. We booked a workshop in the early afternoon and have time for a city sightseeing. The wonder suddenly catches us. 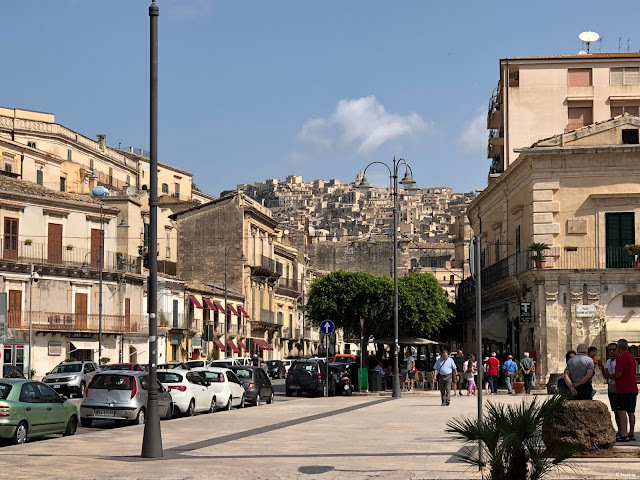 Visiting Modica is like taking a trip back in time to the traditions of the most authentic Sicily. It is a true pearl of the late Baroque period. The ancient city is perched on the hill, the new one develops further down. The atmosphere that you breathe in ancient times may seem obsolete, almost unkempt, but, on closer inspection, it has an authentic spirit instead. Modica is also known as the "100 Churches" city. Parked the car along Corso Umberto, we immediately realize it, finding ourselves in front of the Church of San Pietro, characterizes from the imposing staircase, on which are placed, on imposing pedestals, twelve statues of the apostles (called the "santons") that seem to accompany the visitor up to the inside of the church. The façade is simple and above the central portal the coat of arms of St. Peter emerges. 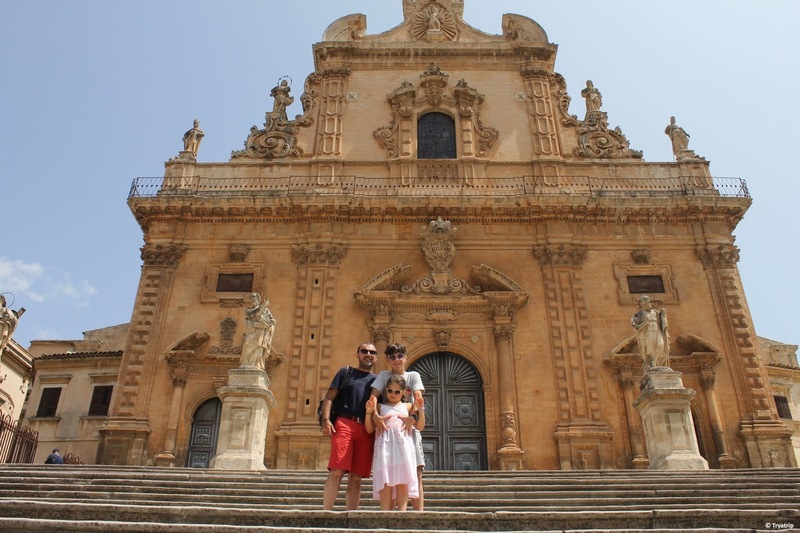 The Cathedral of San Pietro is part, like the Cathedral of San Giorgio, of the list of the Unesco World Heritage sites. We decide to make the guys happy and take the Baroque train, to lighten our legs from climbing to the upper city. The train climbs slowly due to the maze of narrow alleys that, at every turn, offer a spectacular glimpse. A narrative voice accompanies the visit and the train makes stops when the story takes more time. From a small road on the side of the main road you come to the birthplace of the Nobel Prize of Literature Salvatore Quasimodo, a native of here. 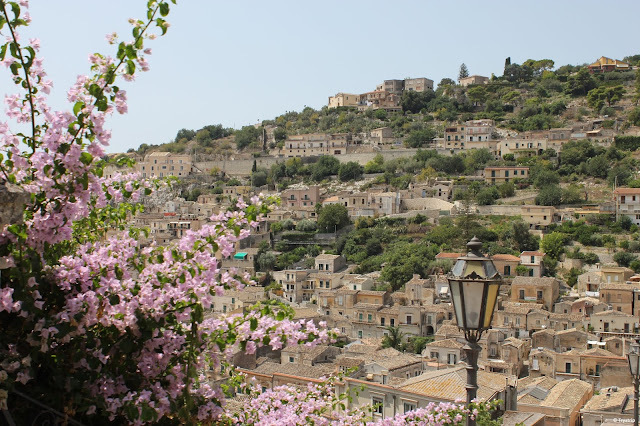 Once in high Modica, you can enjoy a breathtaking view: it seems to be in front of a real-size crib. From the churchyard of San Giorgio, the visitor faces one of the most beautiful "postcards" in the city. Back down, our sweet, sweet workshop awaits us. We have chosen an ancient workshop: the Antica Dolceria Bonajuto, which has been producing its chocolate in Modica since 1880. 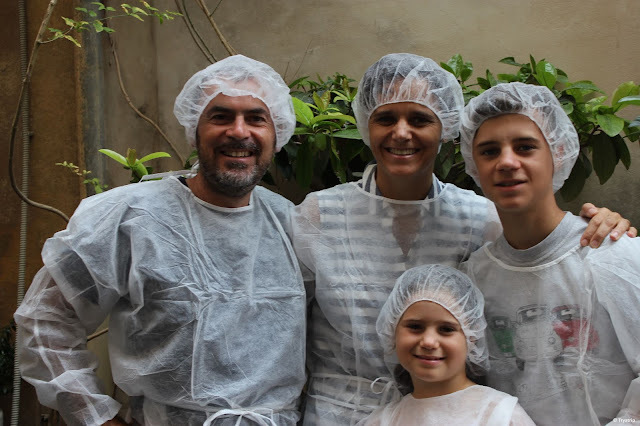 The owner welcomes us in the narrow alley of access to the doceria and gives us the aprons to put on before entering the laboratory. We feel funny, with gauze caps on our heads, but we are excited by the experience. 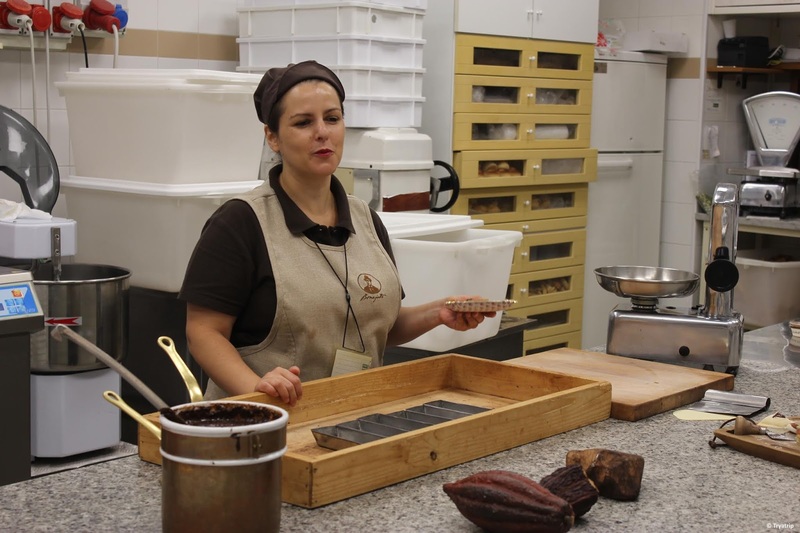 The processing of chocolate, at low temperatures, as happens here, determines the taste and consistency of chocolate, which is grainy on the palate. The Spanish conquistadors brought the xocoátl from Mexico to the Sicilian town, a product made from cocoa beans, chopped on a lukewarm lava stone, called "metate", to let the cocoa butter out and get a grainy paste. The chocolatiers of the laboratory explain everything, proud and passionate about their art. The cocoa mass is processed at 35-40° C, adding granulated sugar, which fails to melt and blend, so the chocolate remains rough and grainy. 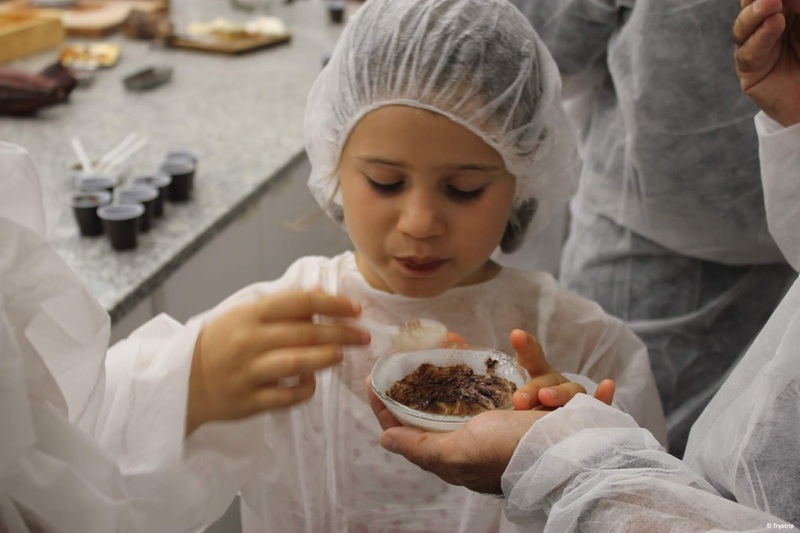 They make us taste everything: from the chocolate paste, which Giulia gathers with her finger, to the slightly liqueur-like chocolate cream, only for adults, to the famous Sicilian cannoli with ricotta and candied fruit. On the chopping board that they deliver to each of us, there are also other typical Modica sweets, such as the "cubbaita", a sesame nougat and Arabian memory honey, and the "nucatoli", cigar-shaped biscuits, made with a base of pasta shortcrust without eggs, and stuffed with dried and candied fruit. A local treat is the Mpanatigghi, breaded biscuits like a small semi-moon-shaped panzerotto, filled with almonds, chocolate, cinnamon and (hear, hear!) Finely chopped beef. But the taste, although particular, is pleasant and does not reveal this unusual content. At the end of the workshop we cannot but go through the shop: the chocolate bars are small and easily carried in a suitcase. We buy several, each with a different colored paper according to taste. We are really satisfied. An interesting and fun experience for the whole family.